This help topic explains in details how you can customize the template of the appointments using AppointmentItemContentTemplate or AppointmentItemContentTemplateSelector properties. The second approach is used when you need to apply different templates according to some custom logic. 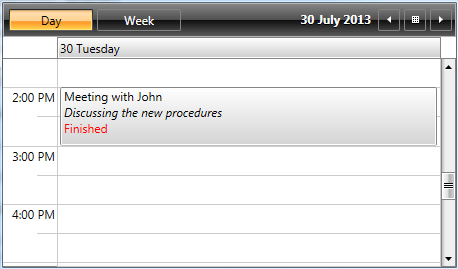 RadScheduleView provides an easy way to change the appointment template through its AppointmentContentTemplate property. The DataContext of the defined DataTemplate that we will be set to AppointmentContentTemplate is of type AppointmentProxy - it holds the most important properties of the Appointment and the Appointment itself. Note that custom properties should be bound through Appointment property of the DataContext. In some cases there is a need to apply different templates to the appointments according to some condition - this can be achieved by setting AppointmentItemContentTemplateSelector property of the ScheduleView control. Let's, for example create separate appointment templates for the different ViewDefinitions of the control - a more detailed template for DayViewDefinition and a simple template for WeekViewDefinition.